A thick marine layer of fog covered the coastline as we flew over British Colombia - a blanket hiding the grand and wild landscape. Slowly, as we approached Alaska we saw mountaintops cut through the fog and clouds hinting at the landscape below. We leaned over the seats in anticipation to get a view of the green and blue that started to show through the breaking weather. The sight brought to life our plans and dreams. I smiled. 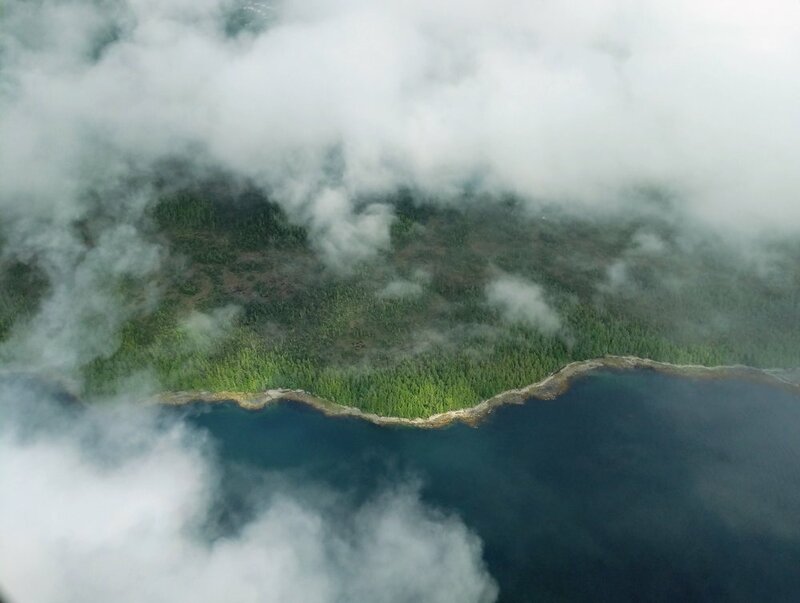 Prince of Wales Island would be our home for the next ten days. Aaron and I landed in Klawock where we would be joining old friends on the fist leg of their 20 day expedition in the South Prince of Wales Wilderness area. We met Andis, Nate, Kim, Wayne, and our outfitter Katie. She dropped us off at the small Harris River Campground for the evening where we repacked our gear, sorted food, and practiced our bear hang engineering skills. The stream nearby smelled of salmon as they returned to the fresh water for their spawn. We sat quietly as the evening air moved into the camp and the stars began to show in the sky. The Milky Way stretched over our tent and I searched for any final meteors of the Perseid Shower which was ending just as our trip was beginning. We woke at 4am and rolled up our tent with dew. Our bags began to form small hills on the road and we sized up the piles imagining how they would fit into plastic and fiberglass hatches. Packing kayaks is always a full body puzzle to solve. Katie collected us and prepared for a boat taxi from Craig to the South Prince of Wales Wilderness area. We hopped onto Katie and Stephanie’s boats and left the last populated area we would be for quite some time. Katie said she would take us as far as the weather and conditions would allow. We passed groups of small islands with rocky shores, cut through narrow passages, watched currents dance around points, and took in the beauty of this remote area. Our boats landed in Klakas Inlet on a small beach where we unloaded our equipment and and kayaks. The sunshine extended our moment of tranquility into an evening of relaxation. We paddled briefly to investigate some sea life and found suitable camping spots on the other side of the river mouth. The sun set and lit the rockweed kelp aglow. A quiet landscape. During our boat ride we saw several humpback wales, seals, sea lions, and birds. The wildlife made the landscape seem even more grand. Katie Rooks, owner of Prince of Wales Excursion Outfitters. Nate helping to navigate the landing. Aaron looking out for rocks. Water taxi drop off location. POW Excursion Outfitters & Emerald Island Adventures. Andis, Wayne, Kim, Aaron, Nate practicing Dolce far niente - the art of doing nothing. 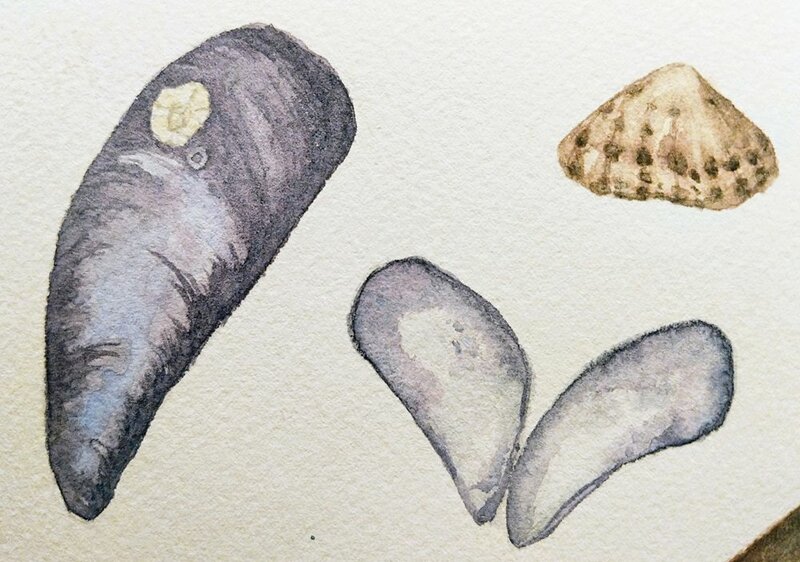 Watercolor paint sketch - Mussels and limpet. Aaron tracked our trip by GPS and created a CalTopo chart of the route. You can follow day by day.